ONE LINE :- This article is about the festival Baisakhi celebrated in punjab. Many of us are shocked to hear the name of Basakhi, especially those who live outside from punjab and india, For example USA, CANADA, AUSTRALIA,JAPAN,HONG KONG GERMANY, the reason for this is also one they can not know about the festival of punjab. What is Baisakhi and why celebrate in Punjab ? 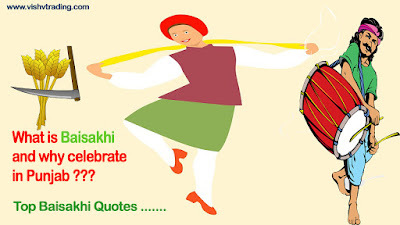 Baisakhi is a festival celebrated in punjab,whcih is related to wheat,it is celebrate in punjab on 13th April,On this day the farmers start harvesting wheat, and in this happiness, the people spend sweets in their village. There is another thing to do with Baisakhi, on the day of 1966, Guru Gobing Singh ji gave the establishment of the khalsa Panth.one more thing is that form this day, on this day farmers are introduced to this year's new year, there are many flok songs associated with Basakhi festival. 1 ):- Baisakhi di Lakh Lakh Vadahiyan. 3):- Aay Baisakhi Kanak di Mukh gaye Rakhi jatta.